If you don't want to see a calendar in a space or on your My Calendars page any more, there are two ways you can remove it. How you proceed depends upon whether you're just hiding the calendar from your view, or deleting it completely. You'll be asked if you want to delete the calendar or remove it from your list. Be Careful! This action is permanent, and will delete the calendar for all users. 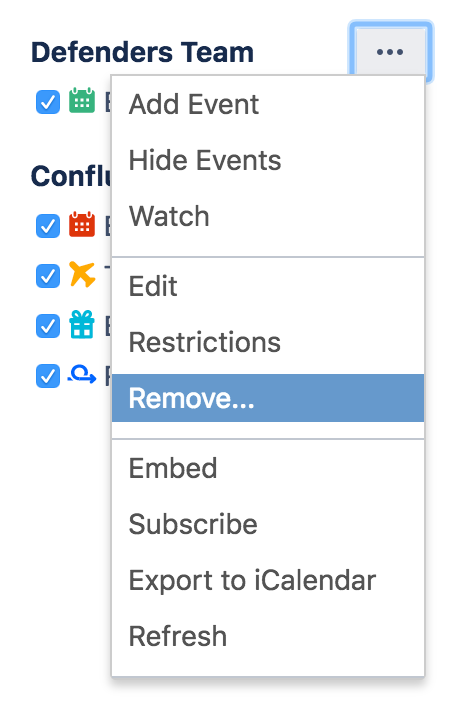 If you're using Confluence Cloud, and you'd like Atlassian Cloud site admins to be able to delete calendars, in addition to the calendar's owner, you can enable that option in your Team Calendars settings. Type Team Calendars in the Confluence quick search to get to your Team Calendars settings, then tick Allow site administrators to manage calendars.